In this article, You will find the information you need to solve the P0190 code the fastest and cheapest way. Learn the symptoms, causes and the fastest solutions to repair this code. What does the P0190 code mean? The P0190 code is triggered when the engine control unit is receiving a faulty signal from the fuel rail pressure sensor. It is a generic OBD2 code which means it applies to all makes and models from around the year 2000. It applies to both diesel, gas and other fuel types on the market. The engine control unit has a range of the signal of the fuel pressure sensor at given RPM/Boost pressure etc. 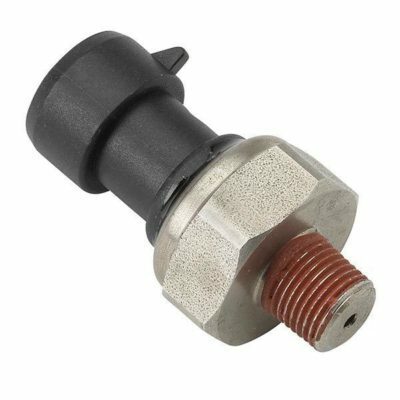 If the signal from the fuel pressure sensor is falling outside of the calculated signal – The p0190 code will be triggered and stored. The most common symptom of the P0190 code is just a check engine light ON and you will not have any other symptoms if it is a sensor problem. Because of this trouble code could both mean a sensor problem and a fuel pressure problem, you could also have other symptoms. If you have a sensor problem, the engine control unit will use the default values for the sensor and you may only experience a check engine light. The most common cause is a failed fuel pressure sensor or faulty wirings to it, but as I mentioned before it can also be a fuel pressure problem depending on what car you have. You should always check your fuel pressure to diagnose this issue. Start with connecting a car battery charger to your car. Make sure that it is charging your car as it should. I would recommend a car battery charger over 4 amperes, as it may drain out your battery if you are having the ignition ON. Connect your OBD2 scanner to your vehicle. Verify the P0190 code. Erase the code and recycle the ignition and start the car(If possible) to see if it is coming back directly. Go into Live data and check the value of the fuel pressure sensor. If the car is not starting and you get a 0bar fuel pressure value, there is most likely a fuel pressure fault. Locate the fuel pressure sensor. Once you have located it you should inspect the connector plug for any corrosion or other damages. Check the wirings if possible. You should now measure the wires with a Digital multimeter. Fuel pressure sensors differ a lot depending on the car model and you should find the right wiring diagram before doing this. But usually, there is one 5 volt power wire, one ground wire and one signal wire. You can check if you get 5 volts and ground from the engine control unit while the ignition is on. If you do not get it, check the wires. If you find any wiring diagram for your fuel pressure sensor you can measure the resistance on the pins to see if there is a short or open circuit in the sensor. Read the Trouble code memory: FOXWELL NT301 Scan Tool. For advanced troubleshooting, you may need a more advanced code scanner. If you have any other questions about the P0190 code, comment down below and I will answer you as fast as possible. If you have any other car questions you are welcome to ask us at our homepage. Hi, Thanks for helpful description. I am getting a OBD2 message “Low fuel pressure sensor reading high” together with the emissionswarning light on my Volvo V40. As it is reading high I presume this would not be a fuel pump failure so is more likely to be a faulty sensor. Yes it sounds like a faulty signal from the pressure sensor. If you have a scanner you can check the value from the fuel pressure sensor to check if it’s realistic or not.